Once the first player finishes, the next player begins. As your players master this drill, the next player can begin his run after the first players makes his change of direction. Form a single file line, facing toward the coach. Player will start by taking a freeze step, and then sprinting at a 45-degree angle forward, then backpedal at a 45-degree angle. Always maintain eye contact with the coach, this simulates locating the runner. Change of direction should come off the plant of the backside foot, the foot away from the direction you are running in. Once the first player finishes, the next player begins. As your players master this drill, the next player can begin his run after the first players makes his change of direction. Start on the goal line; freeze step and sprint to the five-yard line. Square shoulders facing the coach and then plant outside foot, push off with outside leg, and step with inside foot back towards the goal line. Concentrate on touching each line with the hand away from the coach, this will help in squaring the shoulders toward the coach. When running to your left, plant the left foot, and touch the line with the left hand on change of direction. When running to your right, always plant the right foot, and touch the line with the right hand on change of direction. The step-over and back drill is an excellent drill for maintaining vision on the ball while maintaining balance. Player crosses bags while maintaining vision on the coach, don’t look at bags. Keep shoulders square to the L.O.S. ; keep knees bent (Don’t stand erect). When player reaches the end of the bags, he then returns to the starting point, and finishes the drill with a hard five-yard sprint. Start you players off slowly so as not to trip over the bags. As they master their step-over, increase the speed of the step-over drill. Make sure players do not look down at the bag; keep vision on the coach, which represents the ball carrier. Keep shoulders squared to the coach. Player starts with a good two point stance, proper stance should always be reinforced at this point. Drill begins with player taking his mirror step, and then starts into a backpedal. Once reaching the end of the bag, he will sink his hips, and go into his shuffle. Player should always keep his shoulders square, and his eyes on the coach. Once into the shuffle, player always maintains a great base with feet shoulder width apart, and arms pumping; never cross the feet over. On the plant, player will plant the foot to the direction of his movement and drive off, sprint as hard as possible, plant and shuffle. Finish drill by sprinting a hard five yards past the end of the bags. Mirror drill is done with defensive lineman facing the coach, with shoulders parallel to the L.O.S. Player moves on the coach’s direction with the ball. Coach will direct player back and forth through the bags. Layer should move through the bags with knees bent, and hips underneath his shoulders. 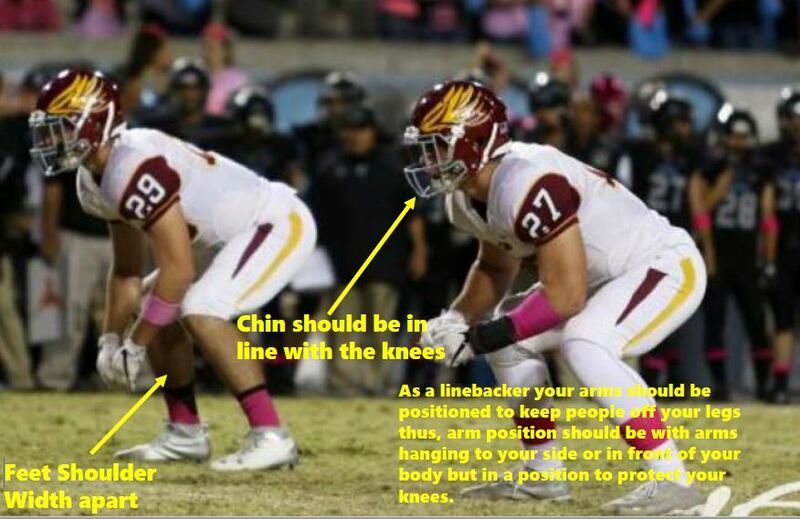 Don’t allow the chin to drift out over the knees. Also, don’t look down at the bags, keep eyes focused on the coach; learn to run with your eyes. This drill requires five bumper bags. Finish drill by sprinting a hard five yards forward. 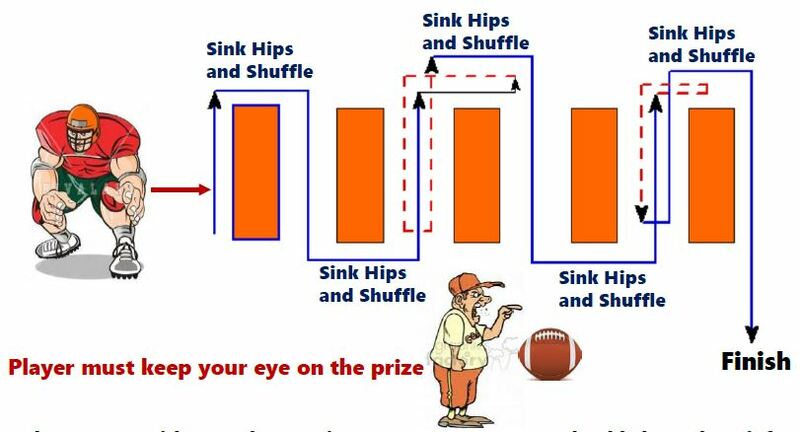 From a two, three or four point stance, defensive linemen will fire out and rip or shiver sled, then shuffle and repeat while moving down the bags. When coming off the last bag, finish with a hard five-yard sprint. While moving down the sled, keep a good base with feet shoulder width apart, don’t’ bring the feet together. Also, keep shoulders parallel to the sled. Always be able to see over the top of the bags; must keep an eye on the coach. Maintain a good hitting position with our hips underneath the defender. Keep vision on the coach.